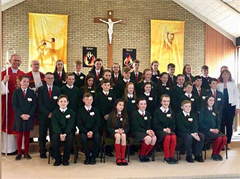 Ni gá do Bhunscoileanna cead a fháil ó thuismitheoiri nó ó chaomhnóirí chun sonraí daltaí na scoile a bhailiú nó a stóráil, nuair atá na sonraí seo ag teastáil chun oideachas a chur ar fáil don pháiste. Tá bonn reachtúil ag an scoil agus suim dlisteanach ag tabhairt faoi shonraí na bpáistí a phróiseáil, agus níl sé riachtanach cead a fháil mar bhonn dleathúil. Primary Schools do not need to get consent from parents / guardians to gather and store their children's data where the data is necessary for administering the education of the children. The school has a statutory basis and a legitimate interest in processing the children's data and do not need to rely on consent as their legal basis. Anseo i nGaelscoil Aonach Urmumhan, bailímid agus déanfaimid próiséasail ar shonraí pearsanta an pháiste mar chuid den phróiséas de bhunoideachas a chur ar fail don pháiste. Chun é seo a dhéanamh, úsáidimid an córas Aladdin chun sonraí an pháiste a chlárú ar an gcóras bainistíochta eolais scoile seo. Ar an gcóras seo, ní úsáidtear na sonraí ach don chúis thuasluaite. Here i nGaelscoil Aonach Urmhumhan, we gather and process your child's personal data for the purposes of administering a primary school education to your child. To facilitate this, we input your child's data into the school’s Management Information System, Aladdin. Aladdin is a secure software as a service application which is owned and run by Cloudware Ltd. (T/A Aladdin Schools), from where the data is only processed for the above purpose.